Laughing foal with healthy teeth shows why making horse dental health a priority is important. The horse's diet and eating patterns have been greatly modified through domestication and confinement. More is demanded from horses beginning at a younger age especially those that are involved in performance and competitive showings. Breeding animals are often selected without regard to dental considerations. As many horse owners recognize, proper dental care has its rewards. Horses are more comfortable and will utilize feed more efficiently when routine dental checkups and treatments are a priority. In addition, horses may perform better and may live longer when their mouths and teeth function properly. Since horses evolved as grazing animals, their teeth are perfectly adapted for that purpose. The forward teeth, known as incisors, function to shear off forage. The cheek teeth, including the molars and premolars with their wide, flat, graveled surfaces, easily grind the feed to a mash before it is swallowed. Like humans, horses get two sets of teeth in their lifetime. The baby teeth, also called deciduous teeth, are temporary. 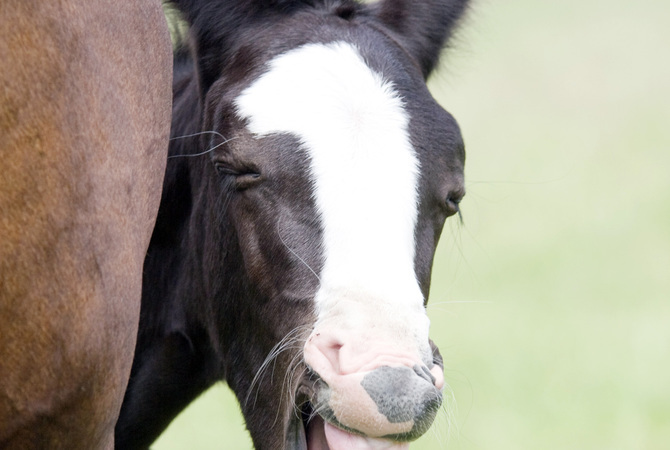 The first deciduous incisors may erupt before the foal is born. The last baby teeth come in when the horse is about 8 months of age. These teeth begin to be replaced by adult teeth around age 2 1/2. By age 5, most horses have their full complement of permanent teeth. An adult male horse has 40 permanent teeth. A mare may have between 36-40, because mares are less likely to have canine teeth, also known as bridle teeth. Veterinarians recommend that dental examinations should begin at the first wellness exam for a newborn foal. Your veterinarian will perform a brief visual and digital examination to check your foal's bite. A normal bite will help ensure that your foal's mandible and maxilla and their teeth will grow and develop in a healthy fashion. Identifying an abnormal bite at an early age, for example parrot mouth, sow mouth or other malocclusions, will allow you and your veterinarian or equine dentist to provide the appropriate care to minimize the impact of these conformation defects from impacting the quality of your horse's life. As your horse grows into a yearling, a 2-year-old and on to become an adult horse, bi-annual dental examinations are normally performed. During dental examinations, your veterinarian or equine dentist will use a bright light source to examine your horse's oral cavity. Depending on your horse's temperament, it may be necessary to use a mild sedative to perform a comprehensive dental exam. Should your veterinarian suspect that your horse has any potential problems based on his eating and medical history, your horse's physical appearance or what the veterinarian or equine dentist are able to ascertain from their physical examination, a device called a speculum will be used to hold your horse's mouth open for a more intensive examination. Horses aged 2 to 5 years may require more frequent dental exams than older horses. Deciduous teeth tend to be softer than permanent teeth and may develop sharp enamel points more quickly Also, there is an extraordinary amount of dental maturation during this period. Twenty-four teeth will be shed and replaced by 36 to 40 adult teeth. To prevent mal-eruption problems, twice-a-year examinations are appropriate for young horses from birth to 5 years of age. Sedatives, local anesthetics, and analgesics can relax the horse and keep him more comfortable during floating and other dental procedures. Such drugs should be administered only by a veterinarian. Most equine dental procedures, including basic floating, irreversibly change the horse's teeth and therefore are most appropriately performed by a veterinarian or an equine dentist. Horses' mouths and teeth are unique to their species and require regular maintenance. Routine dental examinations are essential to your horse's overall health, well-being and comfort. In general, our equine friends should have dental exams two times a year (or more, if deemed necessary by a veterinarian).